Around the country groups of volunteers actively engaged in activity during July's Feel Better Month. In Nelson Laura Richards organised another fundraising event on the 8th July, a Renew You Clothes Swap. Many local businesses, as well as members of the public, donated loads of clothes and accessories, and other goodies, for the event. The local MP provided the venue and a local winery made sure there were a few bottles of wine for those in attendance to sip on whilst perusing what was on offer. Laura also provided makeup tips and tricks at the event and organised for a personal stylist to come along to share her tips with all the ladies too. Apparently, it was a supremely successful afternoon and fun was had by all! Trish wanted me to particularly acknowledge Sue Irvin who helped Trish with selling the Raffles in The Mall and helping with the Fashion Show. 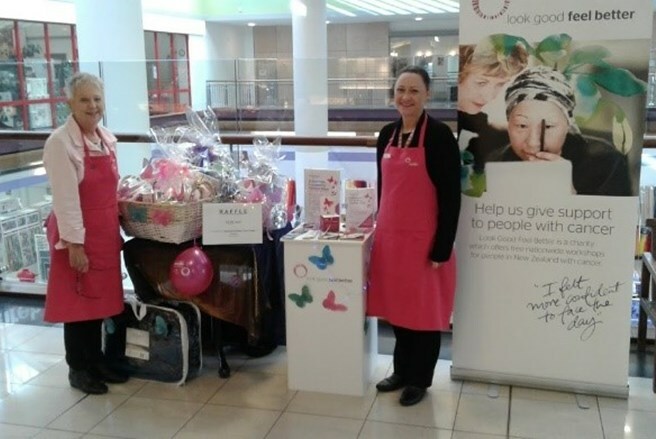 Trish and her helpers put in over 20 hours work over the last 3 weeks selling tickets at their local mall and talking to the public about LGFB.